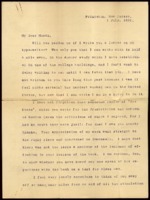 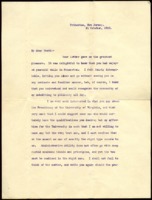 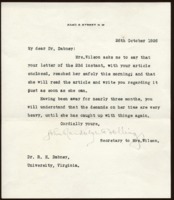 Wilson writes to Dabney, his former University of Virginia classmate (and later history professor at the University) regarding his life after ill health forced him to discontinue his studies. 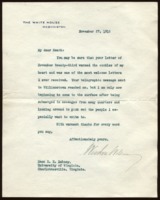 Of interest are twenty letters, 1881-1889, written after Wilson left the University of Virginia. 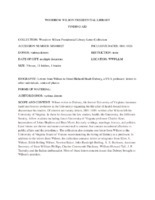 In them he discusses his law studies, health, the University, the Jefferson Society, fellow students including future University of Virginia professor Charles Kent, impressions of Johns Hopkins and Bryn Mawr, his early writings, marriage, history, and politics. 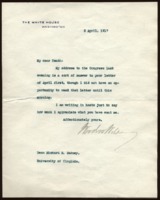 Later letters are shorter and more conventional in content, but contain occasional allusions to public affairs and the presidency. 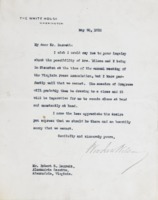 The collection also contains one letter from Wilson to the University of Virginia Board of Visitors recommending the hiring of Dabney as a professor. 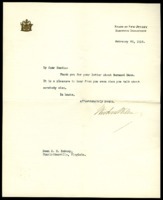 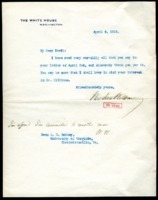 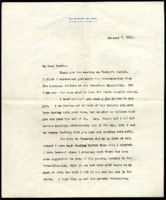 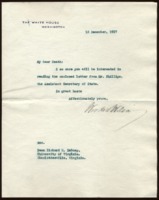 In addition to the letters from Wilson, the collection contains letters or telegrams from Ellen A. Wilson, Edith Bolling Wilson, Newton Baker, John Randolph Bolling, A. S. Burleson, Assistant Secretary of State William Phillips, Charles Cotesworth Pinckney, William Howard Taft, J. P. Tumulty and the Italian ambassador. 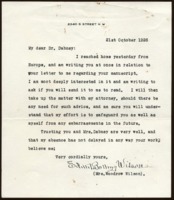 Most of these letters concern issues that Dabney brought to Wilson's attention. 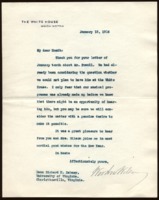 Joseph P. Tumulty replies to Richard Heath Dabney concerning William Scott. 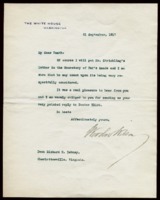 Ellen Axson Wilson writes to Richard Heath Dabney about copying a letter about Woodrow Wilson’s pension for her. 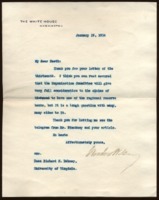 William Howard Taft writes to Richard Heath Dabney, declining to speak at the Univeristy of Virginia. 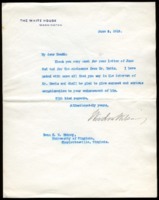 Italian Ambassador Macchi di Cellereso assures Richar Heath Dabney that he will arrange Lieutenant Roselli’s leave as requested. 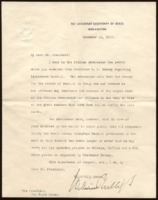 William Phillips writes to Woodrow Wilson, regarding an extension of Lieutenant Bruno Roselli’s leave in America. 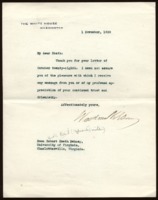 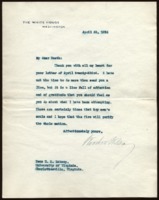 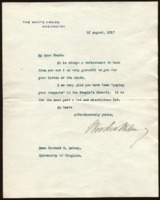 Woodrow Wilson writes Richard Heath Dabney regarding his political enemies and the Graduate College controversy at Princeton University. 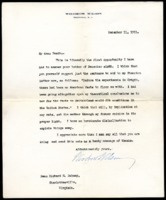 Woodrow Wilson writes to Richard Heath Dabney, regarding Bruno Roselli’s speeches in the United States. 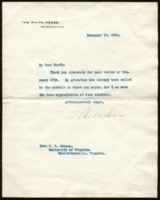 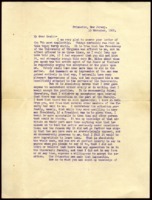 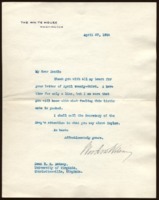 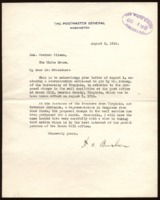 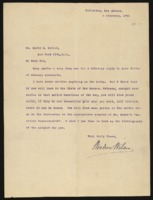 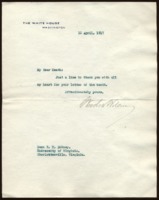 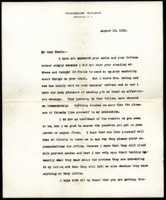 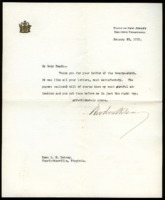 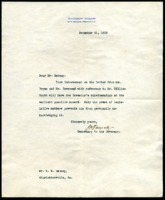 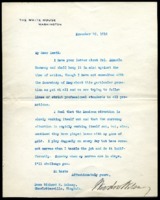 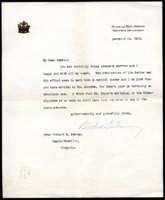 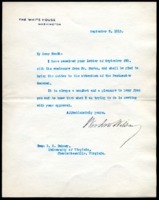 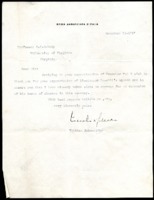 Woodrow Wilson writes to Richard Heath Dabney, regarding the giving of Mr. Strickling’s letter to the Secretary of War. 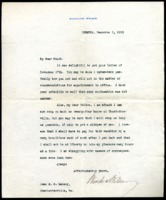 Woodrow Wilson writes to Richard Heath Dabney, regarding the discharge of Andrew A. Hawkins from the service. 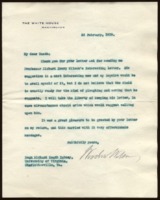 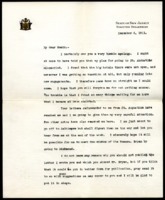 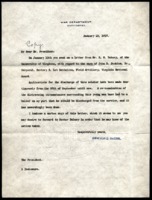 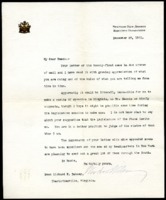 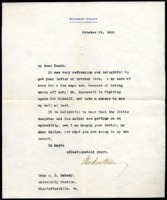 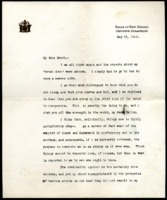 Woodrow Wilson writes to Richard Heath Dabney, regarding Hawkins and the Navy. 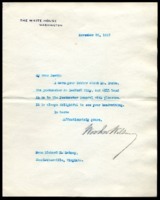 Woodrow Wilson congratulates Richard Heath Dabney on his wedding. 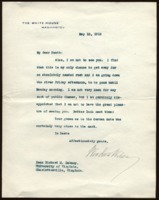 Woodrow Wilson congratulates his friend Richard Heath Dabney on his upcoming wedding and thoughts on marriage. 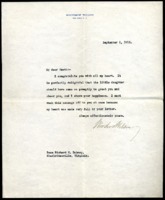 Woodrow Wilson expresses his sorrow over his mother’s death to his friend Richard Heath Dabney. 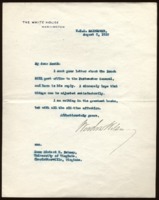 Woodrow Wilson thanks Richard Heath Dabeny for his message. 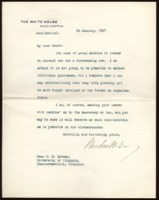 Woodrow Wilson discusses a possible job opening at Bryn Mawr University for his friend Richard Heath Dabney. 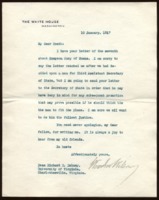 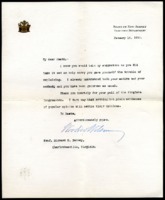 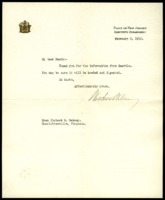 Woodrow Wilson writes to Richard Heath Dabney regarding a change in mail service. 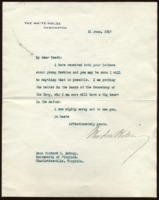 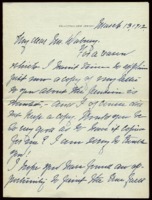 Woodrow Wilson writes to Richard Heath Dabney expressing regret for not being able to see him and commends the closeness of his guess regarding the German note. 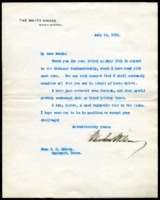 Woodrow Wilson thanks Richard Heath Dabney for his support. 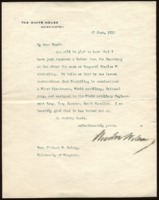 Woodrow Wilson recommends that his friend Richard Heath Dabney accept a teaching position at Bryn Mawr University. 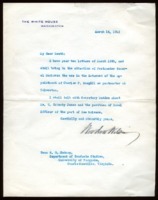 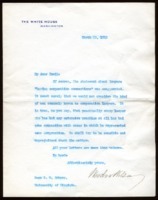 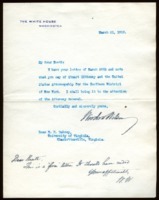 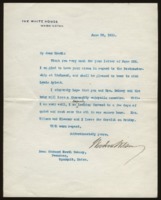 Woodrow Wilson writes to Richard Heath Dabney regarding having Mr. Powell play at the White House. 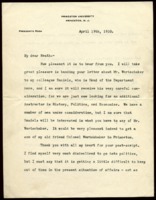 Woodrow Wilson asks his friend Richard Heath Dabney about a teaching position at Indiana University, writing plans and for his opinion on a plan for studying in Germany. 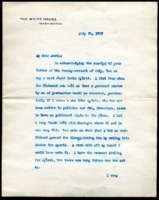 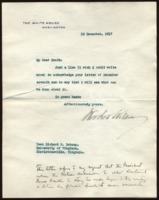 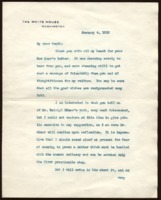 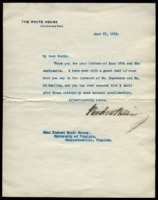 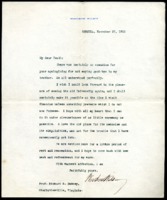 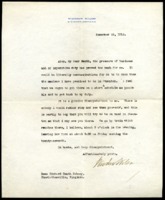 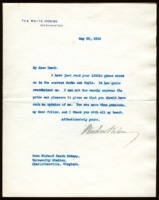 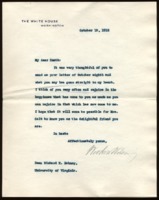 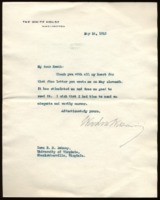 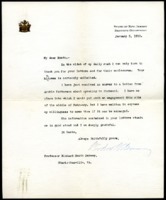 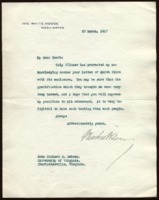 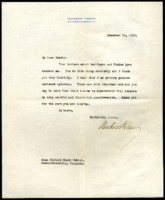 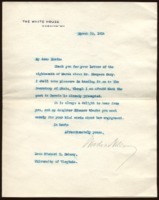 Woodrow Wilson thanks RIchard Heath Dabney for his congratulations on Wilson’s engagement to Edith Bolling Gelt Wilson. 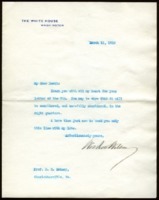 Woodrow Wilson describes his early married life and his feelings about his book, Congressional Government, to his friend Richard Heath Dabney. 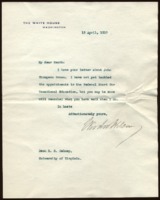 Woodrow Wilson discusses the publication of Congressional Government and his acceptance of a teaching position at Bryn Mawr with his friend, Richard Heath Dabney. 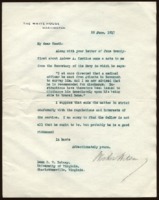 Woodrow Wilson tells his friend, Richard Heath Dabney, about his disappointment about graduate studies at Johns Hopkins University and his engagement to Ellen Louise Axson. 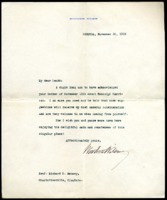 Woodrow Wilson writes to Richard Heath Dabney, declining comment on Raleigh Minor’s manuscript to avoid appearance of sanction. 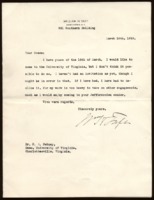 Woodrow Wilson writes to his friend, Richard Heath Dabney, about his decision to leave the law and study history and political science at Johns Hopkins University. 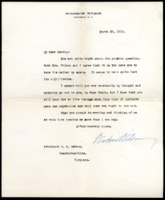 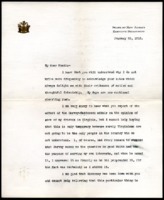 Woodrow Wilson thanks Richard Heath Dabney for condolences on the death of Ellen Axson Wilson. 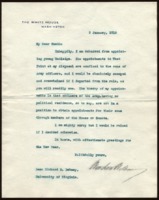 Wodorow Wilson asks his friend Richard Heath Dabney about debate contest results at the University of Virginia and talks about his social life. 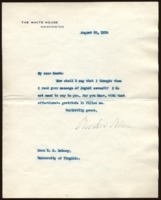 Woodrow Wilson asks his friend Richard Heath Dabney about debate competition at the University of Virginia. 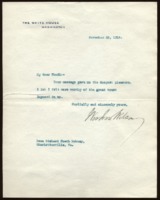 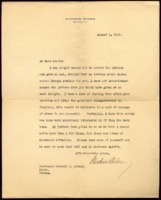 Woodrow Wilson sends a telegram to Richard Heath Dabney with an invitation to lunch. 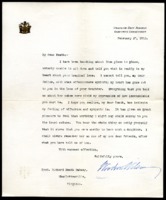 Wodorow Wilson writes his friend Richard Heath Dabney about studying law at home. 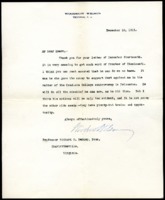 Charles Cotesworth Pinckney sends a telegram to Richard Heath Dabney promoting the Richmond Federal Reserve branch.